In order to prevent such a thick root mass from developing it is advisable to make sure that the tubes are no more than 9 meters in length and that they have a diameter of at least 30cm. an extra close eye on these plants, nutrient shortages can be spotted and corrected, sooner. Correction is achieved by increasing the flow rate and/ or increasing the strength (EC) of the solution. As well as nutrient deficiencies, oxygen shortages are often the first problems seen with the plants at the end of the flow. A shortage of oxygen causes the roots to turn brown with a corresponding drop in the plants uptake of water and nutrient. The chances of oxygen shortages arising are greatest during the fruit forming phase and in stressful situations. Using enzymes that stimulate root decomposition leads to fewer dead roots remaining and a more vibrant plant. Under normal circumstances there will always be a certain amount of dead root material in the system, but, so long as there are enough white, healthy roots, this is no reason for panic. 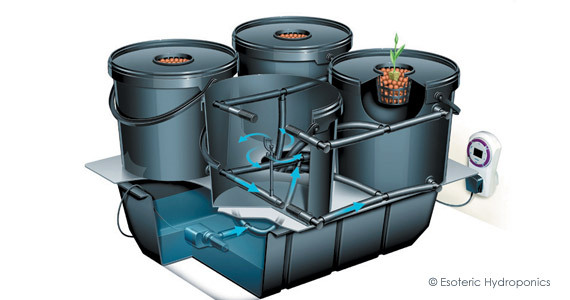 Aeroponics was introduced in 1982, a few years after the NFT system; it originally comes from Israel. 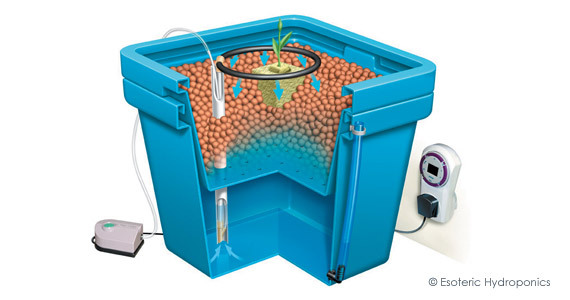 Aeroponics is a system in which misters are used to continuously bathe the roots in very fine droplets. The smaller the droplets are, the better is the contact between the nutrient solution and the roots, and the better is the uptake of food and water. Given that, practically speaking, the roots are growing in air; they always have sufficient oxygen available and large yields become possible. The biggest disadvantages of aeroponic systems are the relatively high initial investment costs and the systems’ proneness to malfunction. Leaving a thin layer of water on the bottom of the misting room will ensure that plants don’t go without water if there should be a system failure. 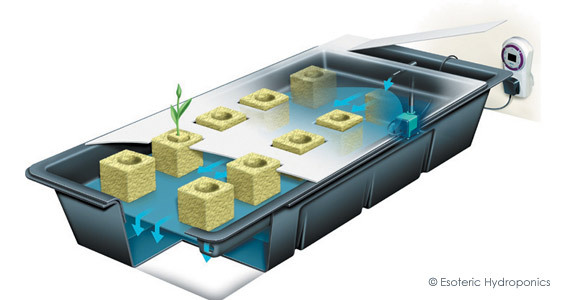 Drip systems are perhaps the most common type of hydroponics systems in the world, owing to their simplicity. A clock controls a pump in the nutrient tank. When the clock switches on the pump and a small drip mechanism drips a nutrient solution over the base of each plant. The excess nutrient solution is caught in the nutrient reservoir for subsequent reuse, or drained away. 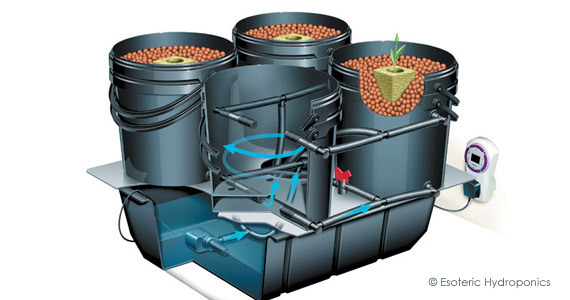 In this system, the plants are kept in an inert substrate. Like with the ebb and flood system, the watering frequency is different.